With more and more state and national forests restricting motorized use on trails, the only way to get to prime fishing spots is by foot or bicycle. The trout I caught above is from the Spokane River in Washington State off of the Centennial Bike Trail. This trail offers 37 miles of river access with another 15,000 miles of bicycle rail trails through out the United Sates and an additional 9,500 miles projected. There are also 44,000 trails that run through 193 million acres of national forest with additional trails in 38 state forests. The majority of these trails run by a river, stream, or lake. I can't tell you how many big mouth, small mouth and trout I have caught out of the Spokane River using my fishing rod holder for bicycles, but one day I brought in 10 fish in less than an hour, while enjoying watching the eagles and osprey fish the river with me. 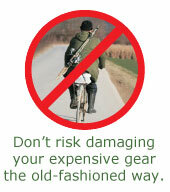 I just throw my fishing rods in my rod holder, some tackle in a small backpack and away I go. With over 80 million bicycles in the United States today and growing this gives the bicycle enthusiasts the opportunity to combine cycling and fishing with the use of the rod holders, not to mention the families like mine that may ride bicycles just to get to their favorite fishing spots that are inaccessible by vehicles or too far to walk. Installation is a snap. 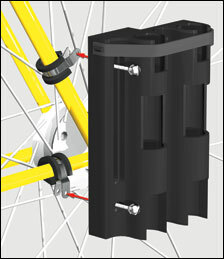 Just tighten two clamps on the back of the rod holder around the back frame of the bicycle and you are ready to go.